UM Journalism School professor Jule Banville is calling all "public radio nerds" and fans of audio storytelling to come together at the Last Best Podcast Festival to enjoy stories from students and independent producers. There's no shortage of live music, arts, or film festivals in Missoula. Now a UM journalism professor wants to add another festival to the mix. This one for podcasts and the people who love them. "I'm Jule Banville, and I launched a podcast this summer called Last Best Stories, and I teach here at the University of Montana Journalism School." Banville is calling all "public radio nerds" and fans of audio storytelling to come together at the Last Best Podcast Festival to enjoy stories from students and independent producers. "Lets bring people together because we're all sort of excited about podcasting and about audio. It's a party. It's party for them." As you probably guessed, the stories on display at the Last Best Podcast Festival all have a Montana thread. "The stories come from students and past students, and also, which is a major ... focus for me, independent producers in Montana. So the stories are linked because they're always about people and places in Montana, but they're done by people who are just starting out, and people who have been at it a while." The Last Best Podcast Festival happens Thursday November 5, at the Roxy Theater in Missoula. For Banville, podcasts serve as a way to get her students interested in audio storytelling, and as a way to get their stories out to interested listeners. "If I let them do their own stories, sometimes they're gonna do these really interesting stories that don't have a place in traditional radio. So podcasting is actually a really great thing for them to think about because it doesn't have to fit those same parameters. Not only length, but topically. Podcasting is one more option for students doing stories to get those stories heard. I don’t want to be the only one that hears them." In one example from the Last Best Podcast, independent producer Lacy Roberts explains how letters from her grandpa changed her perception of Montana when she was at college out of state. Last Best Stories clip: "I was beginning to think of Montana in an entirely different way. It didn't bother me when people asked if I rode horses to school. I started playing it up. I listened to country music talking about the rodeos I'd been to. I was becoming the western girl I never was when I actually lived there. With every passing month my budding nostalgia grew into a fully declared obsession. Within a year, I was basically introducing myself as 'Montana Lacy,' genuine cowgirl, with the zeal of the newly converted. Okay, slight exaggeration..."
Banville hopes to turn the Last Best Podcast Festival into a regular event featuring stories like these. "We're trying to think of this a once a semester kind of deal, as far as the student stuff. But we also think it has possibilities to expand in sort of the film festival model where people submit and we curate. There's not a whole lot of this kind of event happening in Montana, in Idaho, in Wyoming. So I feel like if we could sort of take this as a way to present some of those stories and tell some of those stories, then i think it has potential to grow." 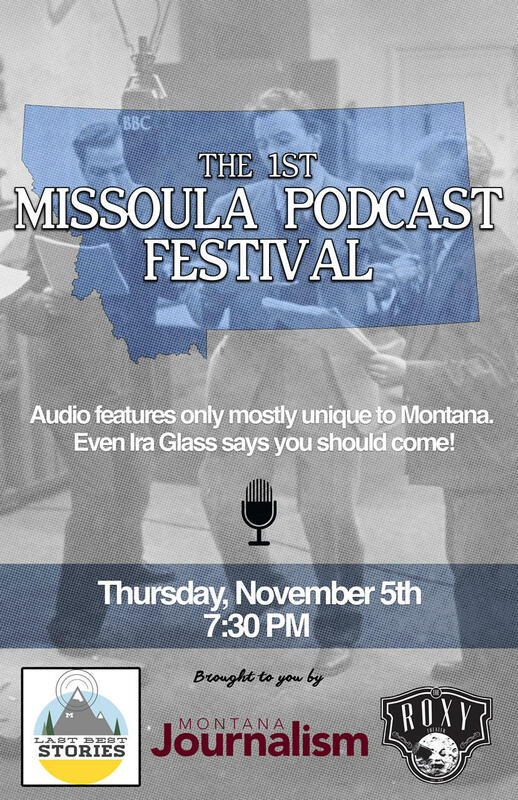 The Last Best Podcast Festival takes place Thursday November 5 at 7:30 p.m., at the Roxy theater in Missoula.